If you own Sony Alpha A6500 Body Only (ILCE-6500), please do leave your feedback too. Sony has manufactured impeccable cameras in the Alpha series over the years. The A6500 is the company’s top tier APS-C mirrorless model. It sports a 24.2MP camera resolution coupled with BIONZ X Image Processor that gives accurate colors & details. The device supports an APS-C type CMOS sensor. It measures 23.5 x 15.6 mm. In terms of dimensions, it measures 120.0 mm in width, 66.9 mm in height, & 53.3 mm in depth. It carries a weight of 453 gms. The A6500 packs a 24.2MP camera resolution so that you never miss out on capturing good pictures and videos. It has an ISO rating of 100-25600, which is expandable up to 51200 for better photos in low light. The minimum shutter speed is 30 seconds while the max shutter speed is 1/4000 which helps you freeze the subject in action. It features both automatic & manual shooting modes. There are 425 focus points which you can set manually for better precision. The vast number of focus points are useful for landscape photography. The camera comes with built-in flash as well as support for external flash. Coming to the display, the Alpha A6500 sports a 3-inch LCD screen. Sony has added touch screen function on its OLED display which users may find useful. 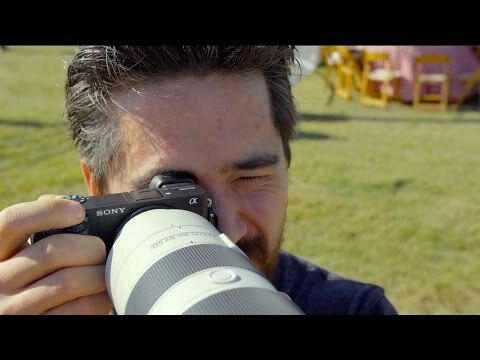 This feature gives an edge over other DSLR’s. It has an electronic viewfinder with 100% coverage. About video & image details, this camera can shoot videos in 720p & 1080p in MPEG-4 AVC, H.264, AVCHD, & XAVC S formats. Images can be shot in JPEG, RAW, EXIF & DCF formats. It also has HDR support. Coming to the audio, this DSLR features built in speaker & supports Digital Dolby (AC-3), linear PCM & MP4. Other features include image sensor shift mechanism with 5-axis compensation, silent shooting, face detection, dust reduction, red eye reduction, & panorama. Connectivity options on the A6500 include a tripod socket, 3.5 mm headphone jack, a USB 2.0 port, a built-in stereo microphone input & a Type-C mini HDMI connector. In terms of storage, the A6500 supports SD, SDHC, SDXC, Memory stick PRO duo, memory stick micro(m2), microSD, microSDHC & microSDXC memory cards. It also features WiFi, Bluetooth & NFC. The device comes with a Lithium battery to power it. With the purchase of Sony Alpha A6500, you will get a battery, charger, wide strap, installation disk, an interface cable & 2 years warranty from the date of purchase.